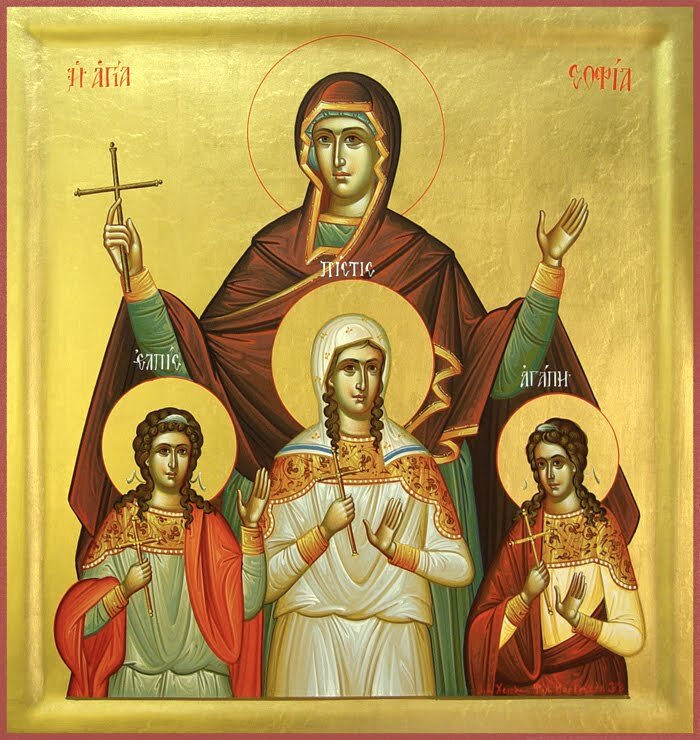 Church tradition says that in the second half of the first century in Rome lived a pious woman, a Christian, that says Sofia. She had three daughters who wore the names of Christian virtues - Faith, Hope and Love. Sofia and her daughters did not hide their faith openly professed her. As understood that Emperor Hadrian (117-138) ordered to bring them to him. When standing in front of the emperor, all attendees were wowed by stokoystvieto them. Adrian tried to persuade them to offer a sacrifice to the goddess Artemis, but young girls (Faith was 12 years old Nadezhda - 10 and Love - 9 years) remained adamant, then the emperor commanded them tortured brutally. A mother was forced to watch the inhuman torture and suffering of their children. But she showed remarkable strength throughout. Girls do not withstand the torture and die, and the emperor allowed the world Sofia to take the bodies of their daughters to bury them. Three days after the death of her children died and their mother, who also was buried with them. Church honors and the world Sofia as a martyr, because as a mother she lived with my heart horrible torture for Christ their beloved daughters. The relics of the Holy Martyrs Sofia, Faith, Hope and Love rest of 777 in Alsace, France. On this day, the table is put fresh bread (loaf) and grapes. In the secular calendar and in the church, this date is celebrated main virtues: faith, hope, love and wisdom. According to tradition, women distributed bread and seasonal fruit for health. Each show mercy to people in trouble and poor - helps to poor and orphan guest will not be refunded and given food. Name Day celebrate: Vera, Verka, Faith, Luba, Luben, Lubo, Love, Ljubomir, Lubomira, Ljubco, Nada, Hope, Nadia, Sevda, Sophie, Sofia and other related.